Say hello to the best cheesecake I’ve ever had. 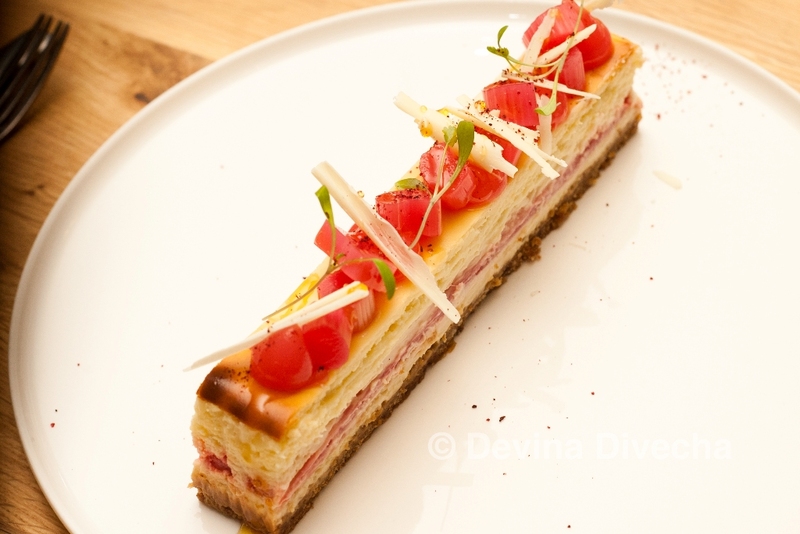 This is the baked white chocolate and rhubarb cheesecake from The British Larder in Suffolk, UK. I was whisked off to this gorgeous gastropub in Woodbridge in Suffolk in late 2013 (December 23, to be precise – and yes I’m aware I’m more than a year late in sharing!) on one cold, windy evening. It was all very stressful, as the trains were running late that day due to weather conditions, and I was on my way back to Ipswich after a long trek across the country (Ipswich-Leicester-Leeds-Ipswich in two days…never again). The trains had been timed perfectly, or so I thought, but by the time I rolled out at Ipswich’s train station, we were watching the clock. We were only slightly late, thank goodness, and we, the group of five, were ushered inside a warm, cosy pub. And now I will warn you: as I ate this more than a year ago, and took no notes, I have only vague recollections of everything I ate. At the time I was sure I’d post my thoughts within a few days, and then life took over. Readers of this blog [so, that’s three of us? :)] may have noticed the draught of posts. So when I returned, I decided it had to be with this, even though I couldn’t talk about more than just the cheesecake. The cheesecake was sublime. Baked just to the right amount, rhubarb snaked its way through the delicate, yet filling, cake – and took my breath away. I Instagram’d and tweeted right away, so excited was I to finally find, what I thought was the cheesecake holy grail. Bramfield slow-cooked sirloin, Boulanger potato, caramelised shallot, red wine sauce. Practical tips: Go with an empty stomach, and be ready to spend a few hours there. Website here. I am on their mailing list – I really wanted to visit and do even more now!